This May, Georgia State President Mark Becker and ten students will attempt to climb Mount Baker, a glaciated volcano, in Washington’s North Cascade mountain range.No course credit is being offered for making the ascent, according to Becker. 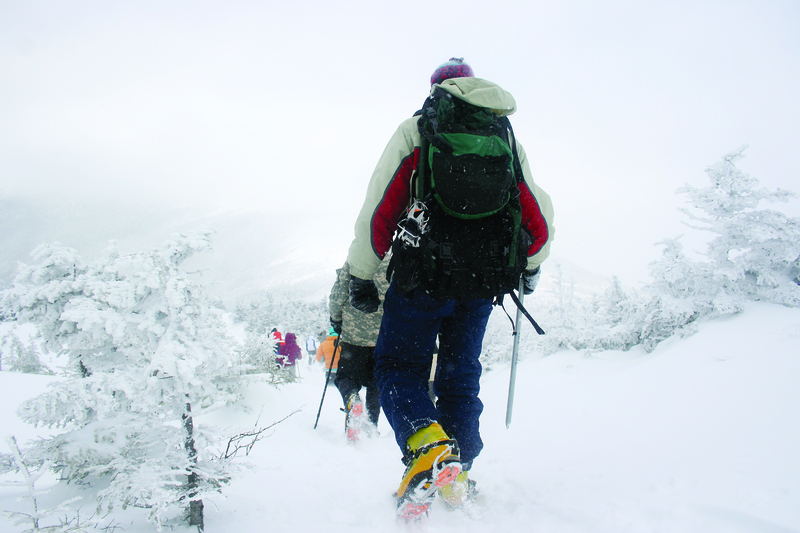 Students traverse the snowy mountainside of the White Mountains in New Hampshire during Touch The Earth’s 2012 Spring Break adventure. Becker is sponsoring the trip with Carson Tortorige, coordinator of Georgia State’s Touch the Earth program.Touch the Earth is part of Georgia State’s Recreational Services and offers outdoor recreational activities including paddling, climbing and cycling, according to the program’s website. They also offer outdoor equipment rentals. Becker, Tortorige and three trained guides from the American Alpine Institute (AAI) will lead the ascent of Mount Baker. The cost to the trip is expected to be funded by Touch the Earth scholarships and donations made through Impact Georgia State, the same crowdfunding program that paid for the university’s marching band to play in 2014’s Macy’s Thanksgiving Day Parade in New York City. Tortorige said Touch the Earth received approximately 55 applications from students wanting to climb Mount Baker with Becker. Only ten candidates will receive official invitations. Before the journey students will be required to attend four local hiking training sessions, according to the program description. Students will be expected to carry equipment, camp on snow and climb up to 5,000 feet in a single day. Becker said enjoying cold weather is essential to camping on mountain snow. Mount Baker is categorized as an active volcano. In 1975-76 new volcanic activity began in the Sherman Crater directly south of Mount Baker, introducing magma into the volcano and creating several steam vents, according to the U.S. Geological Survey (USGS). “Although monitoring was increased as a result to the 1975-76 activity, much of it has been dismantled and monitoring at Mount Baker is now insufficient due to the threat that renewed activity would pose to nearby communities and regional infrastructure. Mount Baker is one of several Cascade volcanoes that are high priority to have their monitoring systems enhanced in the coming years,” according to the USGS website. Mount Baker last erupted 6,700 years ago. Becker said he has enjoyed has enjoyed hiking, backpacking and the mountains since high school but it was after a postdoctoral fellow at the University of Washington without summiting Mount Rainier, he vowed to one day return. Becker also said this year he has been ice climbing in New Hampshire and Colorado and has plans later this year to climb Oregon’s Mount Hood (11,250 feet) and to attend a two-week expedition skills seminar in Peru. The itinerary of the seminar in Peru includes climbs of Ishinca (18,143 feet), Urus (17,782 feet) and Copa (20,302 feet) in the Cordillera Blanca mountain range. There are no official plans as of yet for a mountain climbing trip sanctioned by Georgia State for 2016 but Becker said it is being discussed. “I am having conversations with friends and guides about a couple of climbs on my bucket list. The climbs of Mount Hood and in Peru will give me an idea of where best to focus my planning and training for 2016,” he said. Becker also said he hopes this year’s trip will inspire the students attending. “I hope that, at a minimum, every student will come away from this trip with the appreciation that they can attain big goals in life. Climbing mountains requires physical training, mental preparation, and the honing of specific skills,” he said.